In the years 1939 and 1940, the Soviet Union and Finland were at war. The smaller Finnish army proved tenacious, and the Soviets had to bring troops from afar, including from regions that had no experience of hard winters. The Soviet army paid a heavy price for this lack of experience, as the incident known as the ‘Sausage War’ illustrates. By December 5, 1939, the Soviet 155th Division was advancing toward IIomantsi. Pajari commanded the Finnish defenders and stabilized the front. It was decided that the Finns should deliver a counter-attack to boost morale, but the Soviets pre-empted an attack with one of their own. On the 12th the Finns were ready to resume their plans. Yet while the Finns attacked the Soviets broke through their lines. They were about 3 miles northwest of Tolvajärvi and preparing to take the Finns by surprise by attacking their supply line. They encountered little resistance until they came upon a field kitchen. The cooks had just made sausages. The starving soldiers stopped to fill their bellies, bringing the advance to a sudden halt. Naturally, the Finns took advantage of this unplanned meal break to regroup. The Russians fled into the woods but were relentlessly hunted down and killed. Had they not stopped for takeaway, the Finnish advance might have been stopped. Many Soviet troops froze to death in the savage Finnish winter. After prolonged shivering, they would have felt warm and sleepy, a condition known as hypothermia. During hypothermia, organs begin to shut down. Some of the corpses were discovered naked. This is because the body, withdrawing heat from the extremities to the vital organs, suddenly releases it shortly before death. The person then becomes very hot and may take off all their clothes. 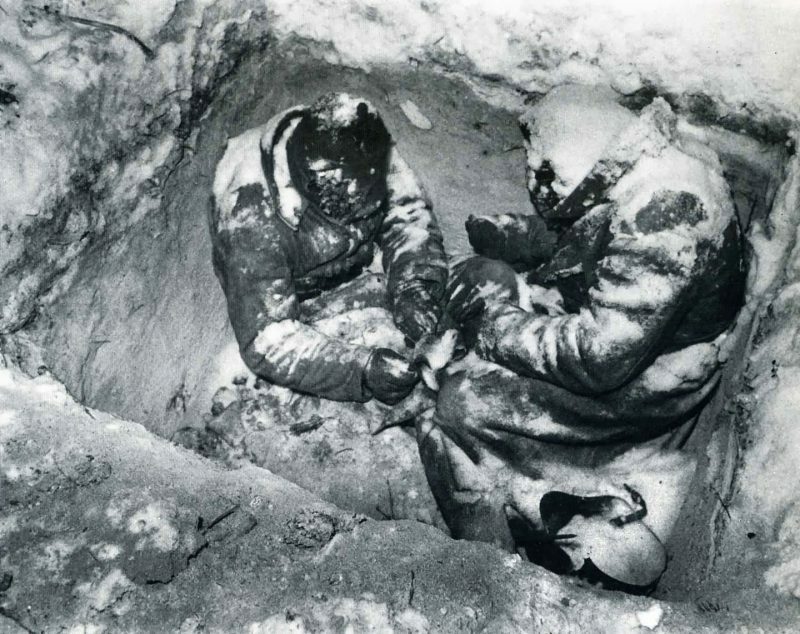 These photos show two such Soviet soldiers frozen in their foxhole.